So, have you ever found yourself standing at the check out line or a fabric counter and the clerk, trying to make small talk while cutting small squares of lace, asks what you are going to make with the fabric you are buying? Excitedly you tell her about this idea you saw in Better Homes and Gardens for Lace Dyed Easter Eggs. How they took little tiny squares of lace and cheesecloth and trim and wrapped them tightly around hard boiled eggs and closed them off with a rubber band. Then you explain how you have to use “food coloring” not “Easter egg dye” because food coloring won’t seep beneath the fabric like the dye will. You want to make sure she understands completely the intricacy of this project. 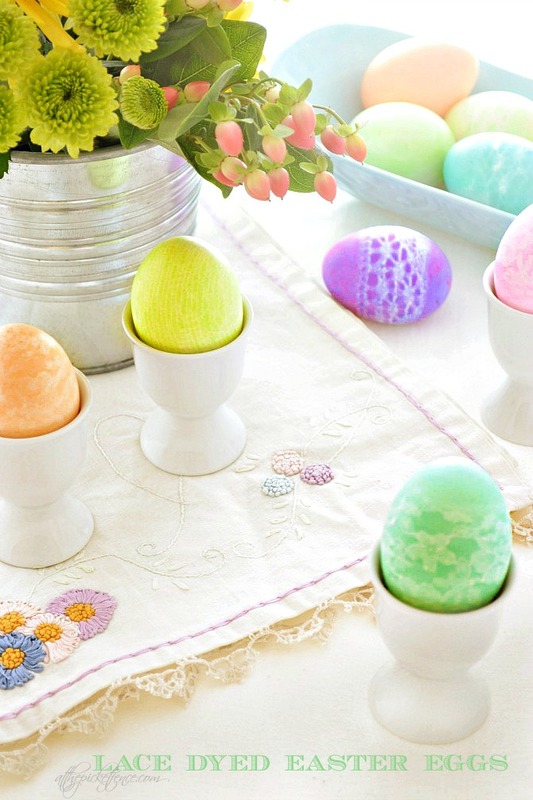 You make sure she know that after dying the eggs to the preferred color they must be patted dry with paper towels and the rubber band carefully snipped off so that you can slowly remove the lace from the egg to reveal a lovely pattern across its surface. You make sure she TRULY understands that you REALLY need this project to work, because it’s your blog post for the next day and if it doesn’t…you got nothin’…. and I mean NOTHIN’ else to share with your readers and you just KNOW it’s going to work and you’ll have pretty lace dyed eggs even if it takes all afternoon to make them. And, as her eyes start to glaze over and she tilts her head quizzically at the mention of a “blog post” and “readers” you just know in the back of her mind she’s thinking…. I wonder if this strange, rambling lady knows we sell plastic eggs on aisle 12 for .79 a bag. 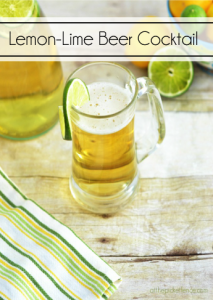 This project is super cute and easy but takes a little trial and error to get a distinctive pattern. 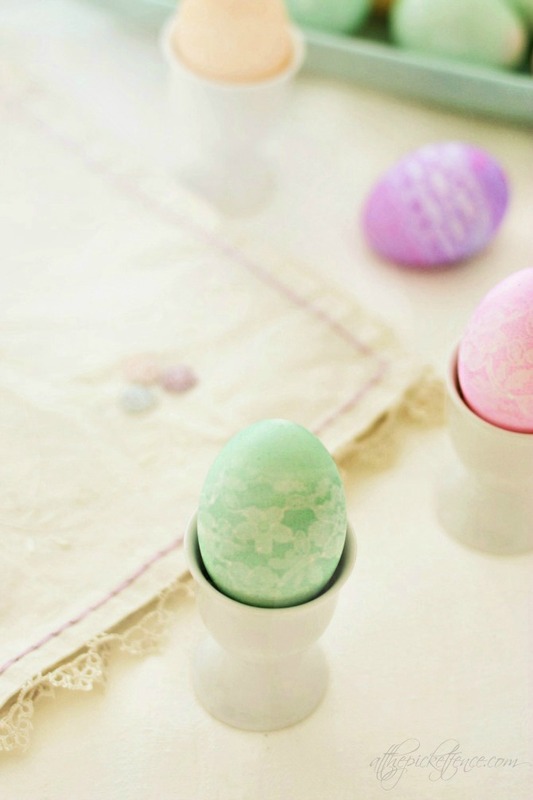 Be sure to wrap your egg tightly with the lace giving a little twist before tying off with rubber band! We’re getting excited for Easter here At The Picket Fence! 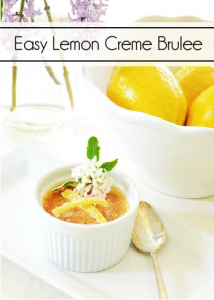 Stay tuned next week for some more fabulous Easter and Spring ideas! Have a lovely “spring” weekend…remember SPRING can live in your heart…even if there is still snow on the ground! 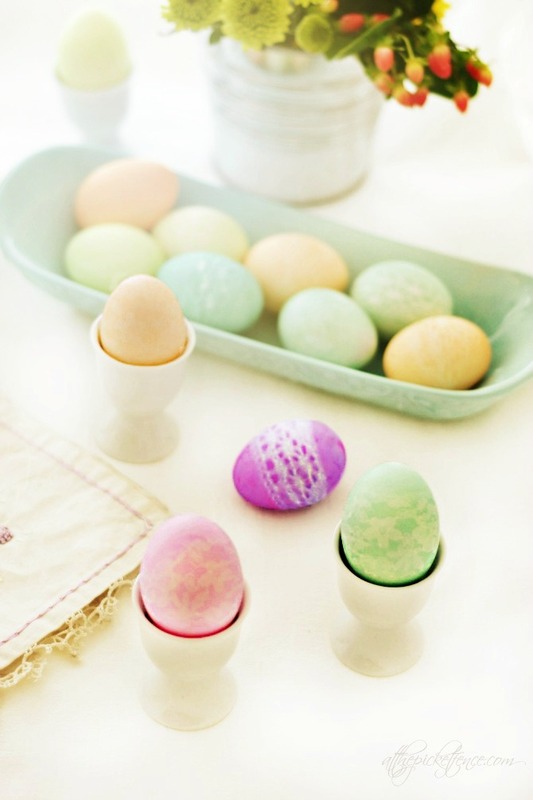 30 Comments on "Lace Dyed Easter Eggs"
I saw it in BHG too but did not get around to make them. Yours are adorable! Happy Spring! LOL!!! I’m not sure what I like better, the story or the eggs.. 🙂 But since you worked so hard I will have to say the Adorably Sweet eggs 🙂 Your pictures are lovely as always! Have a Fabulous Friday!! I love the lacy look! Very soft and feminine. I know what you mean by doing projects and butting up against a deadline!!! Sometimes I think that is my life!!! This year I’m not making eggs. So I’ll save this for next year! So pretty! Those are too pretty to eat! Thank you for sharing! 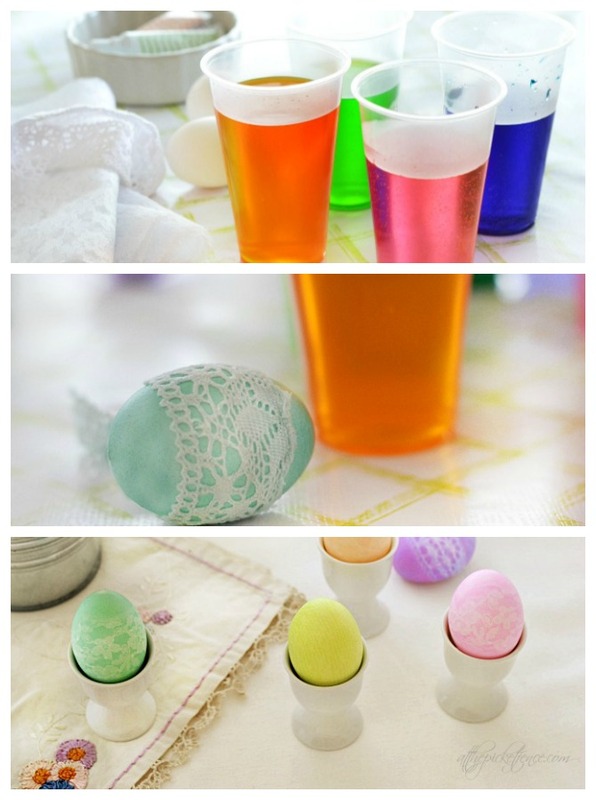 I am going to give this a try.Much more fun than just dunking the eggs in the dye! Beautiful colors and the lace adds so much elegance. join the Easter egg hunt after… so fun. I so love this project! Well done! 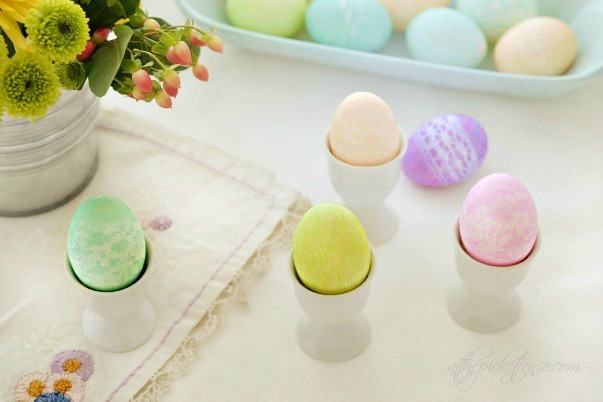 Your lace dyed eggs are lovely Heather! 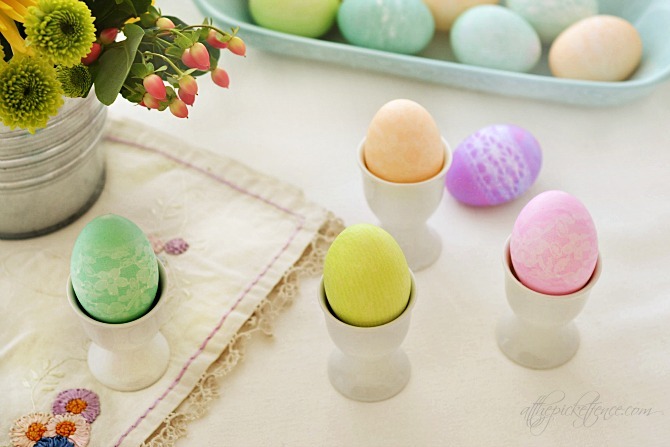 I haven’t thought of the painted eggs yet – I still have Easter dresses to make! EEEEEKKKK! Favorite post of the week! I laughed right out loud at the part about the plastic eggs. I’m still chuckling. But now, the project is very copy cat-able. I would love to do it. So pretty! I bought extra eggs so I’ll try making lace eggs! Those eggs are beautiful and love how they turned out ! Have a blessed weekend ! These are beautiful! I haven’t painted eggs in forever, but I’m going to try this out! Well done brave soul. I did eggs last year (I think last year???) using men’s silk ties — another fun technique. Loved your story — not everyone understands us bloggers, right? 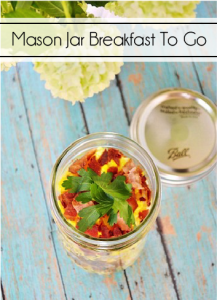 Love your lacy eggs . . great idea! I enjoyed meeting you at the “Meet Up.”. (I sat next to you!). Happy Easter Days . . . These are just gorgeous, love the pastel colours. I’m planning on decorating some eggs with my little boy this week so we may try this, thank you. Those are so pretty and feminine looking! Love them! I was laughing so hard that I almost typed in my name as LOL! Thanks so much for the sweet story…..I don’t think that clerk will ever look at Easter eggs the same again! So crazy pretty! I will have to try it! LOL!! I am the .79 cents a bag lady this year! 🙂 Yours are so pretty, though!